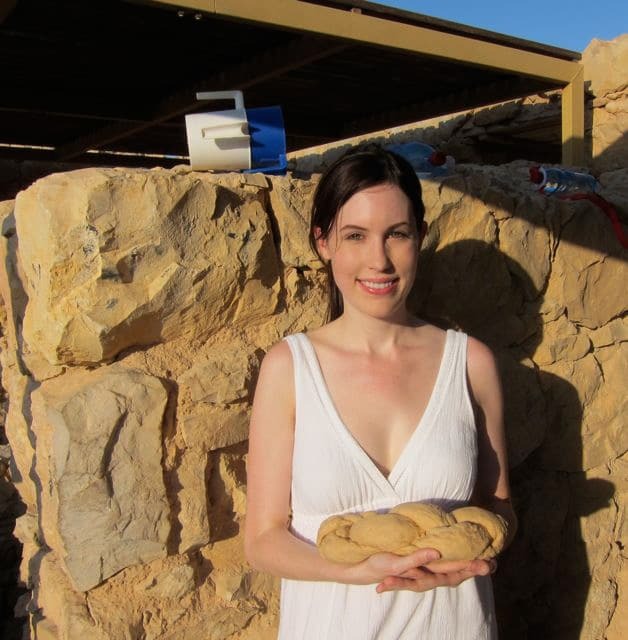 Me and challah on top of Masada in Israel – July 2010. 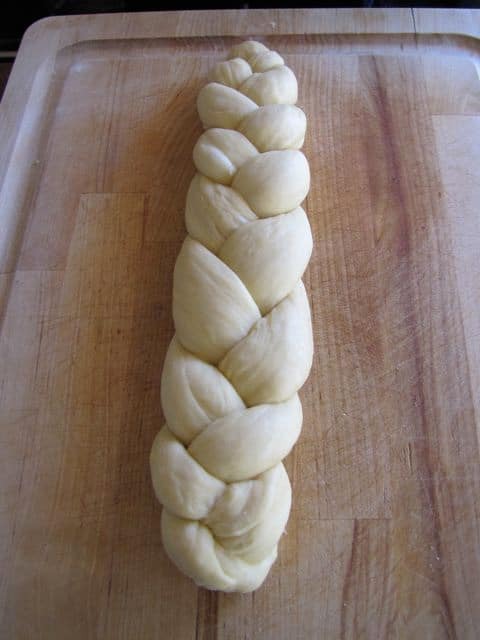 And now for my favorite part of baking challah– braiding!! Braiding challah is super fun. I know some of you are probably thinking “this is way too complicated for me.” But trust me, once you get a feel for the dough you’ll fall in love with the braiding process. I’ve listed every potential mistake I can think of in this blog to help you stay on track. So why not jump in and give it a try? All that work will result in a gorgeous challah that you can proudly display as the centerpiece for your dinner table. 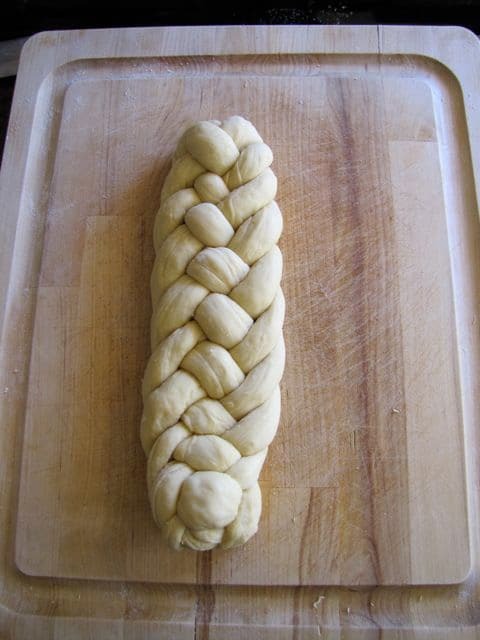 I feel such a sense of accomplishment when I create a beautifully braided challah– it makes my inner artist happy! There are many different ways to braid a challah. I’m going to share my favorite ways with you here, including two ways to make a round loaf for Rosh Hashanah. 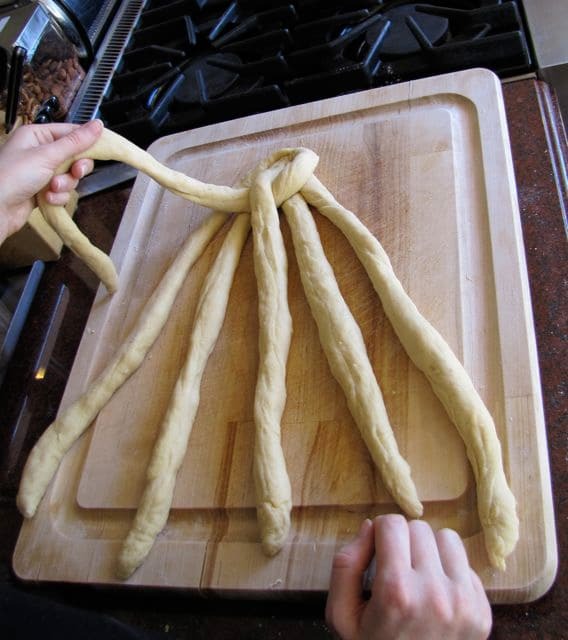 First, you need to learn how to make a nice even strand from the dough. All the braids are made from strands, so it’s important to know how to make a fundamental strand shape. 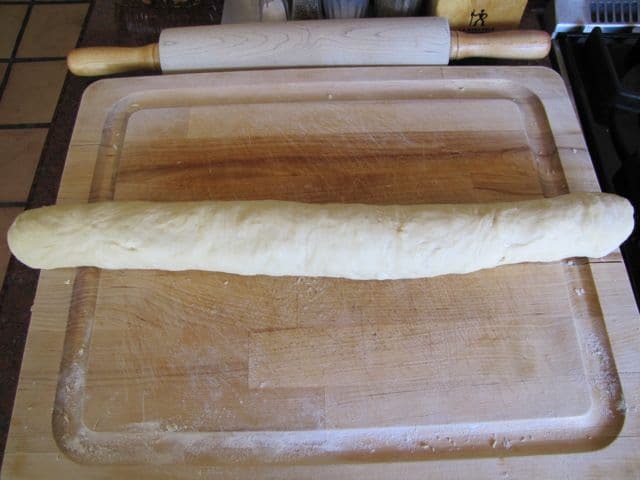 Take one of the portions and roll it out with a rolling pin until it is flat and about 1/4 inch thick. Don’t worry about the shape of the dough, it doesn’t matter. 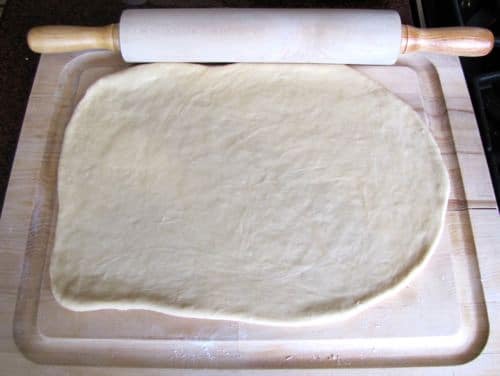 Put the smaller part of the dough towards the top of your rolling surface, with the widest part towards the bottom. 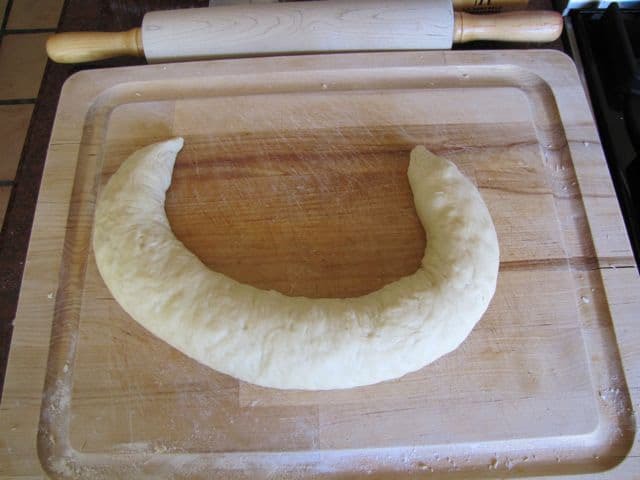 Using both hands, put pressure on the rolling surface and pull the dough back towards you, rolling it back into a strand shape. 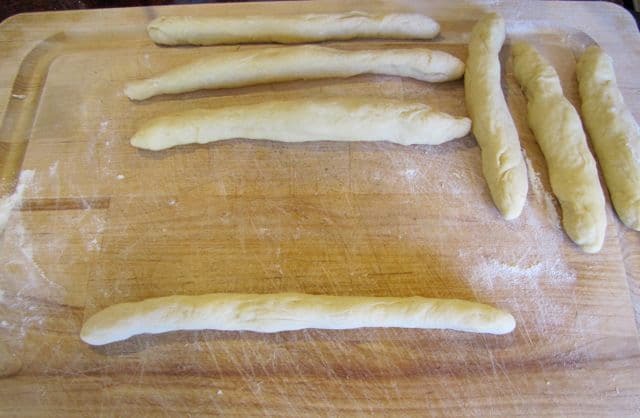 Keep even pressure on the dough as you roll so that no air pockets collect in the strand. And that’s how you make a strand! Simple, right? Now, before we start braiding, I want to share a few tips with you that I’ve learned from trial and error over the years. 2. Once you start braiding, continue until you are finished. If you walk away from a half-braided challah, you might lose your place in the braid, which can make things a lot more complicated. 3. For braids that start with the strands being pinched together at the top (Four- and Six-Strand braids), pinch them somewhat loosely at the beginning of the braiding process. I’ve found that often I like to “unpinch” this top section when I’m finished braiding so I can re-braid the top of the challah into a tighter, neater braid. This gives a cleaner look to the challah overall. 4. If your dough is sticking to the board, keep your surface lightly floured as you braid. 5. Don’t get discouraged! Making even strands and pretty braids takes some practice. Follow the steps here carefully, be patient with yourself, and most importantly HAVE FUN! 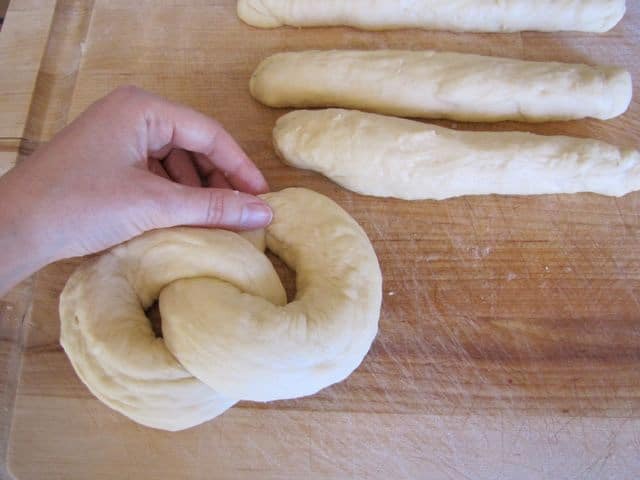 This is the easiest way to braid a challah. For those of you who know how to braid hair, this should come naturally to you. I like to start the braid in the middle of the strands instead of the top because it gives the challah a more even, balanced shape. 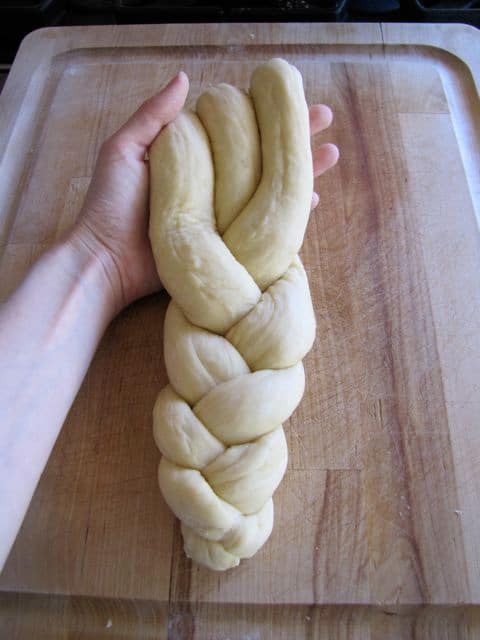 The important thing to remember when braiding a Three-Strand Challah is to be aware of your middle strand. 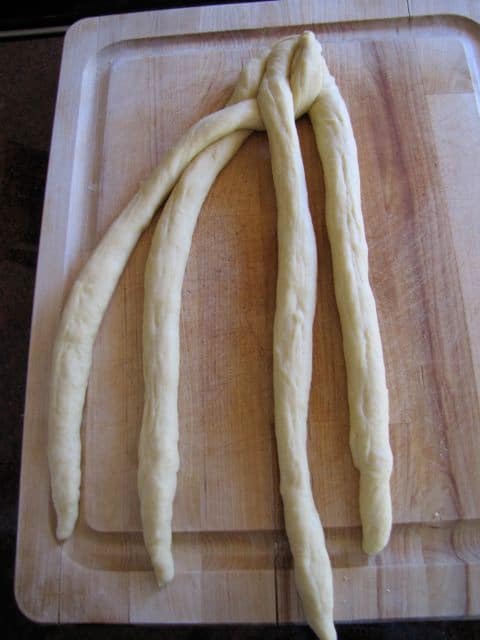 Each strand of dough will take a turn being the middle strand; keeping your eye on the middle strand will help you stay on track as you braid. 1. Create three equal-size strands. Lay the three strands side-by-side. 2. Grab the center of the right strand and cross it over the middle strand, drop it in the center. The right strand is now your middle strand. 3. Grab your left strand and cross it over the middle strand. The left strand becomes your middle strand. 4. 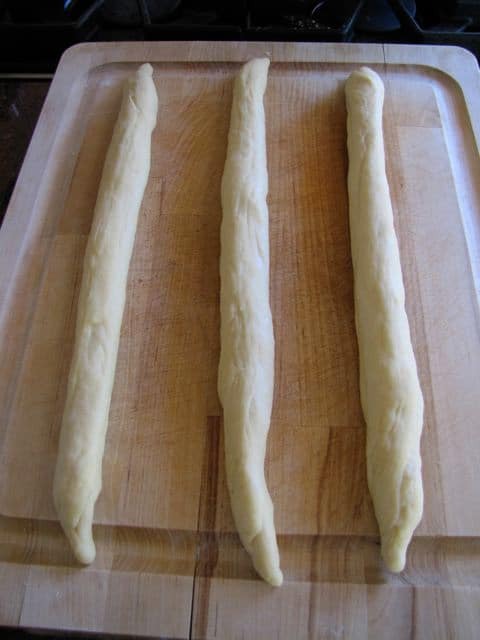 Repeat steps 2 and 3 (right strand to middle, left strand to middle) until you have braided your challah to the very end. Pinch the three strands together at the end. and flip it towards you so the challah is now upside down and the unbraided strands are facing downward. 6. Continue braiding by grabbing the left strand and crossing it over the middle strand. The left strand becomes your middle strand. 7. Grab the right strand and cross it over the middle strand, drop it in the center. The right strand is now your middle strand. 8. 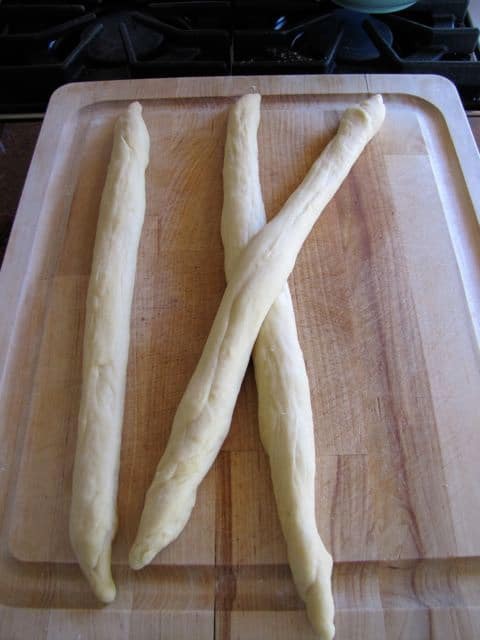 Repeat steps 6 and 7 (left strand to middle, right strand to middle) until your challah is fully braided. Pinch the ends of the loose strands together and tuck both the top and bottom tips of the challah under to create a nice rounded shape. 9. Brush with egg wash, top if desired, then allow challah to rise. Bake according to your challah recipe’s instructions. The Four-Strand Challah is my favorite braid. I love the design it creates. When braiding a Four-Strand Challah it’s important to remember that you always start with the strand that is furthest to the right. Memorize the “over, under, over” pattern and say it out loud as you braid to keep you on track. 1. Create four equal-size strands. Lay the four strands side-by-side, then pinch them together so they are connected at the top. 2. Take the strand furthest to the right and weave it towards the left through the other strands using this pattern: over, under, over. 3. Take the strand furthest to the right and repeat the weaving pattern again: over, under, over. Repeat this pattern, always starting with the strand furthest to the right, until the whole loaf is braided. 4. Pinch the ends of the loose strands together and tuck them under on both ends of the challah loaf to create a nice shape. 5. Brush with egg wash, top if desired, then allow challah to rise. Bake according to your challah recipe’s instructions. A Six-Strand Challah is somewhat more complex than the Three- and Four-Strand braids, but once you get the hang of it it’s actually pretty simple. 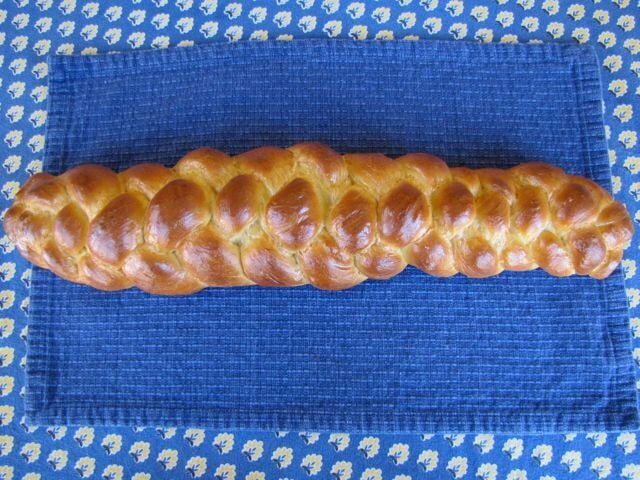 This braid creates a thick, wide challah with a pretty design. 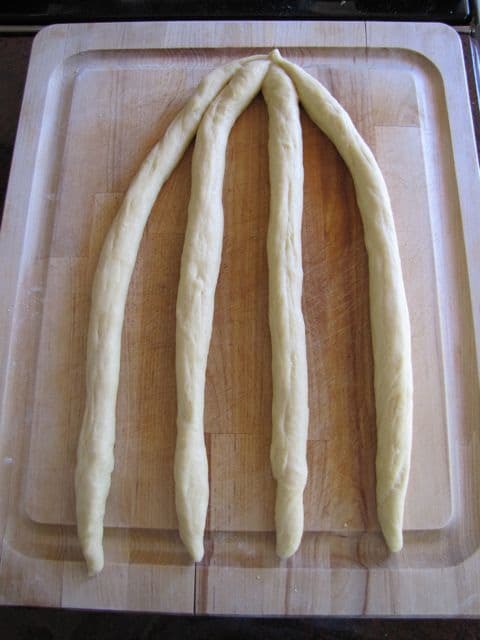 When braiding a Six-Strand Challah, like with the Four-Strand, it’s important to remember that you always start with the strand that is furthest to the right. Memorize the “over 2, under 1, over 2” pattern and say it out loud as you braid to keep you on track. 1. Create six equal-size strands. Lay the six strands side-by-side, then pinch them together so they are connected at the top. 2. Take the strand furthest to the right and weave it towards the left through the other strands using this pattern: over 2 strands, under 1 strand, over 2 strands. 3. Take the strand furthest to the right and repeat the weaving pattern again: over 2 strands, under 1 strand, over 2 strands. Repeat this pattern, always starting with the strand furthest to the right, until the whole loaf is braided. 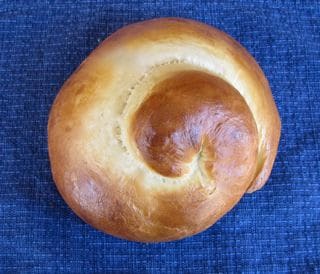 For the Rosh Hashanah holiday, challah is baked into a spiral shape– sometimes called a “Turban Challah.” The shape symbolizes the cycle of a year coming to a close, and a new cycle beginning. 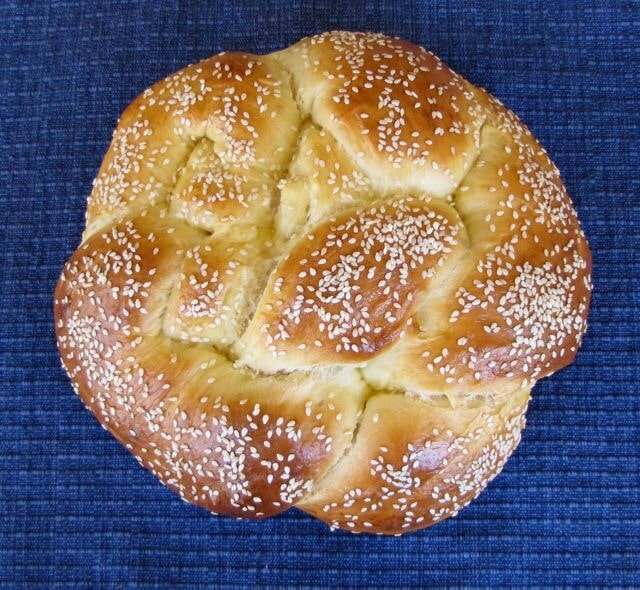 This type of challah is usually baked with raisins in the dough to signify a “sweet” new year. Concealing the raisins inside the dough creates a prettier, more uniform challah. 1. Knead and roll to flatten the dough into a rough rectangular shape, about a 1/2 inch thick. 2. 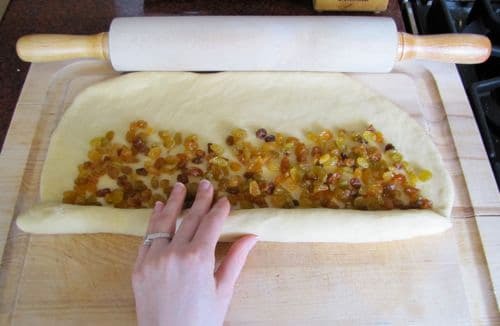 If adding raisins, sprinkle them evenly across the center of the rectangle. Use either black or golden raisins, whichever you prefer. 3. Use your hands to rolls the dough from the bottom upward into one large, even strand, making sure to roll tightly to avoid air pockets. 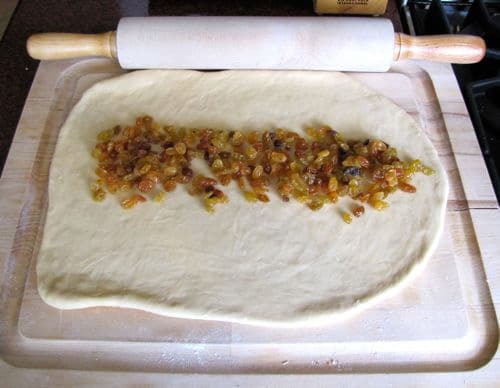 The raisins will be concealed inside the dough. 4. 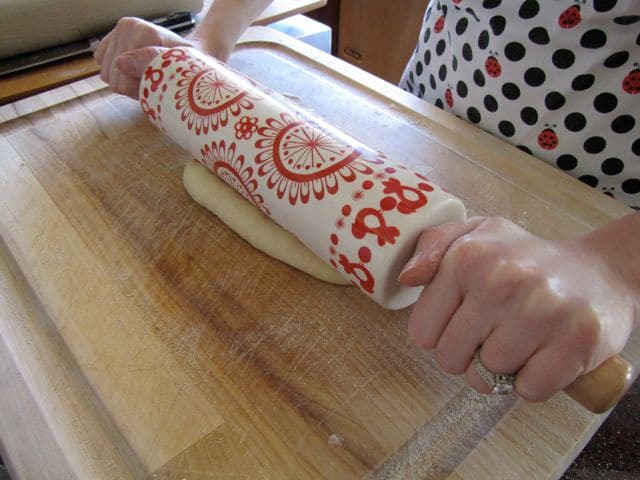 Roll the dough using both hands to smooth seams and create one large strand. 5. 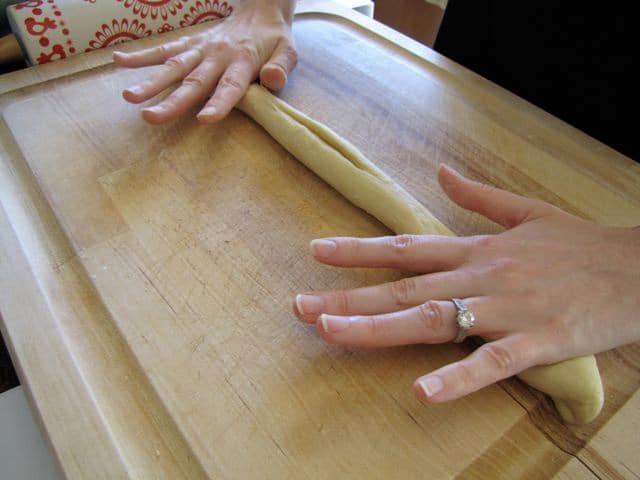 Taper the strand at the ends by rolling the dough between your palms. 6. 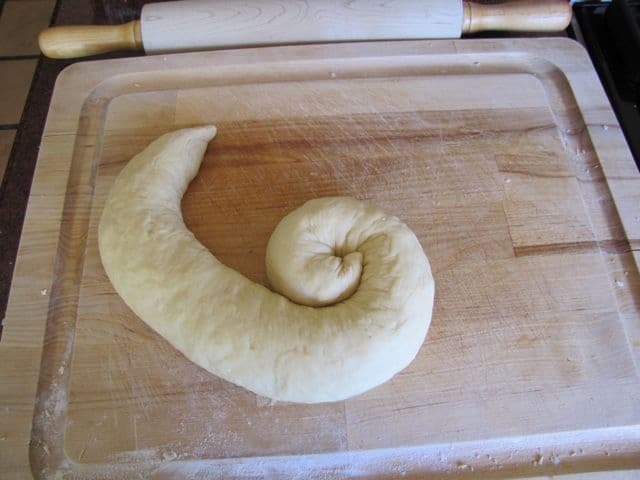 Roll one end of the strand inward to create a spiral snail-shell shape. 7. Continue rolling the strand in the same direction until the spiral is complete. 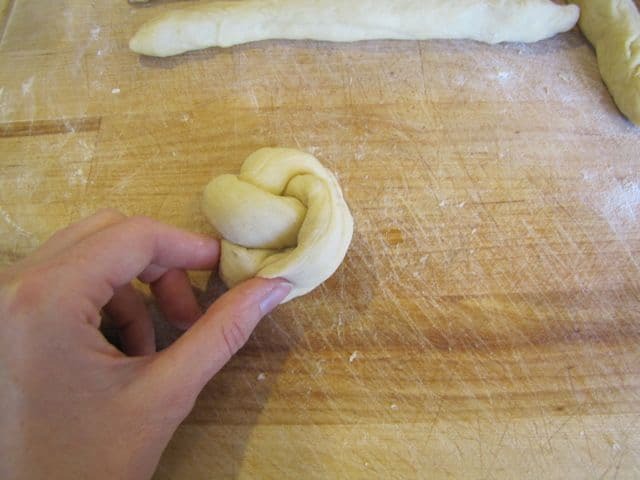 Tuck the loose end of the spiral underneath the challah and pinch it tightly into the bottom, securing it. 8. Brush with egg wash and top, if desired. Allow challah to rise for at least 45 minutes until you can press your finger into the dough and it doesn’t bounce back. The last rise is very important with this challah shape, since it is prone to splitting. Bake according to your challah recipe’s instructions. Note that this shape may require more baking time than a normal challah due to its bulk. This is my favorite way to make a round challah loaf, and will give you another option for your round Rosh Hashanah challah. The chain shape represents unity, strength, and togetherness. While the pattern looks intricate, it’s actually quite simple to make. 1. Divide the dough into five thick equal-size strands. Don’t taper the strands as you would for a normal challah braid. 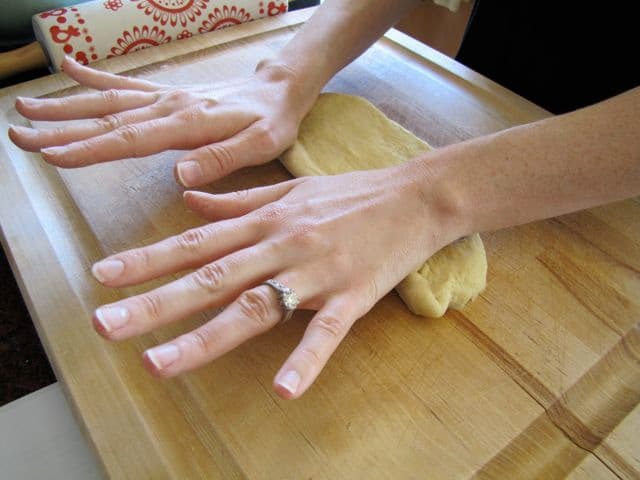 Form one strand into a circle, pinching the ends together to create a ring of dough. 2. Take another strand and connect it to the first circle as in a chain. Pinch the ends together to form a second circle. 3. Repeat the process until all the strands form a complete chain. The final circle links to the first one to create a round challah shape. 4. Brush with egg wash, top if desired, and allow challah to rise. Bake according to your challah recipe’s instructions. Note that this shape may require more baking time than a normal challah due to its bulk. Use your challah dough to make some pretty and delicious challah dinner rolls! 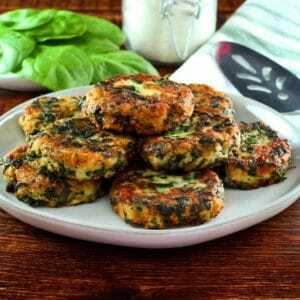 They are so simple to make, and they’re sure to impress your dinner guests. To save time, I often make these early in the morning and shape them into rolls, then cover the cookie sheet with plastic and place it in the refrigerator. I take it out of the refrigerator about 30 minutes before baking so the dough can return to room temperature. 1. 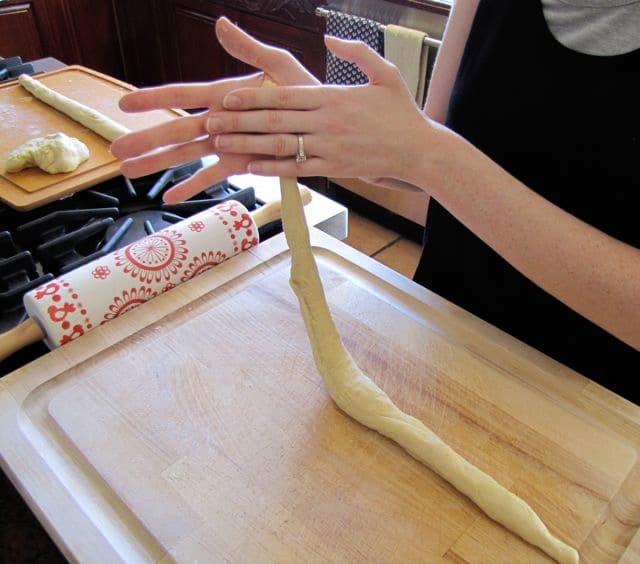 Roll your dough into equal-sized strands that are about 9 inches long. 2. 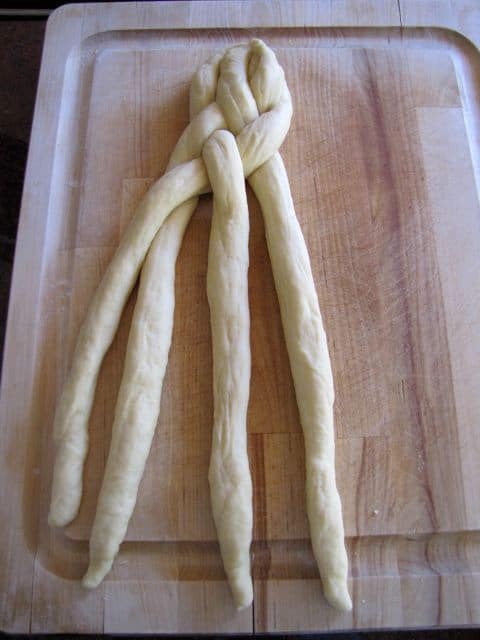 For each strand, start by tying a knot in the dough. 3. 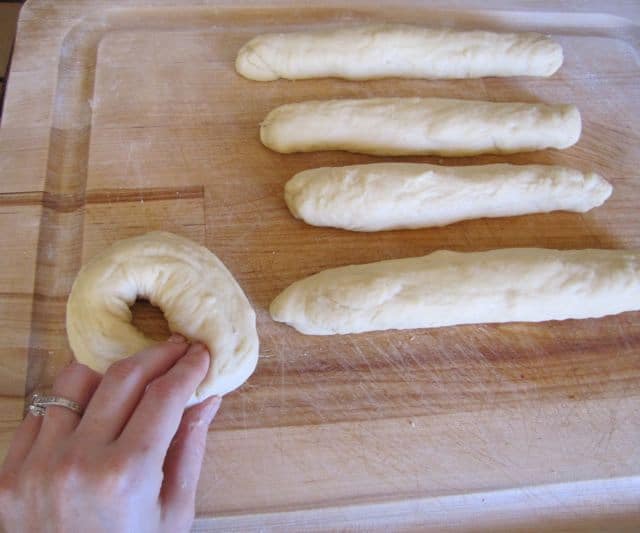 Pinch the two loose ends together to create a roll shape. 4. Place the seam side down on a greased cookie sheet. Brush with egg wash, top if desired, and allow to rise. Bake as you would a traditional challah braid. They may cook slightly faster than a braid, so keep an eye on them towards the end of the baking process. Hello Tori, I enjoy reading your blog and I have to say that I love love love Challah bread. I don’t consider myself an expert but my Challah comes out decent. I usually make the double braid (top/bottom) and my family love it. The last one I did it was HUGE (lol) barely made out of the oven. Thanks for sharing how-to guides to braid the bread. I could not find the nutritional information on this site. Diabetics require this information if they are to enjoy your enticing creation. Please include the nutritional information with the recipe. Thank you. Kermit, I don’t currently offer calorie breakdowns on my recipes. The nutrition calculators available online are not always reliable, and nutrition stats of various ingredients can vary from brand to brand (sodium content, calories, etc.). There are calorie calculators online you can use where you can plug in the specific brands you use. Just Google “calorie calculator” and you should get many results. Excellent blog! I went to old town Israel and they served challah on the street with some type of green herb (pesto like) olive oil maybe dipping sauce. Do you have any idea what that was and how to make it? Love your site. I’ve struggled with this typical 4 braid method. I found success with the British-US method. Simply place the 4 strands like a star with ends pinched together in the center. Then criss cross the across strands with the strands passing on the right (like driving US). Then cross cross the up/down strands passing on the left (British driving). Repeat. Across passes on the right, up/down passes on the left. As the loaf gets longer, it forms a log. Makes a nice high loaf. So thankful I found this site. My daughter has to make challah for a class project. 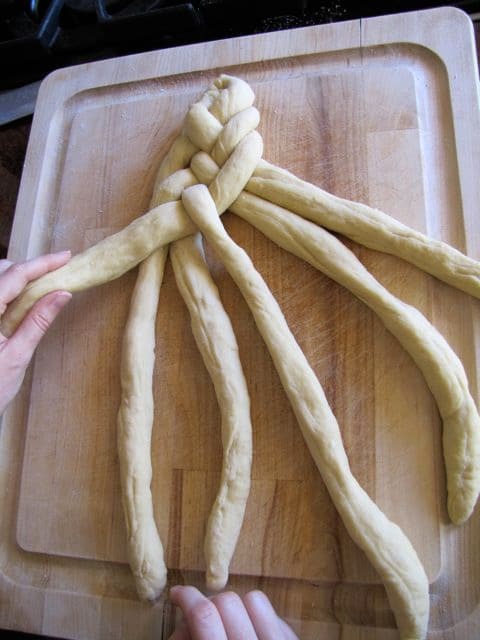 While I make bread often, the braiding part seemed daunting. I will be using a high altitude recipe I found as yeast breads act quite differently where I live. I’ll take a picture when we’re done. Thanks so much for the tips…especially on braiding. Now I can expand beyond three! What can you tell me about freezing the dough. At what point? Hi Cheryl- you can bake, then freeze, or you can freeze the dough. To freeze after baking, place the bread while it’s still warm from the oven (not hot) in a plastic zipper bag. Squeeze as much air as possible out of the bag before sealing. When ready to warm up, put in a 300 degree oven till warmed through, just before serving– this will make the bread taste more fresh. If you want to freeze the dough and bake later, allow the dough to rise and shape into loaves. Place the braided dough in the freezer until it gets hard. Wrap it in plastic wrap in three layers, then freeze until needed (no longer than 1 month, or you risk freezer burn). When thawing, remove plastic wrap, allow to thaw/rise for 2-3 hours until risen and a finger indentation stays in the dough rather than bouncing back, then bake as directed. My challah turned out beautiful! I had made some before but your recipe was easier & tastier! The braiding was much easier than I expected! Thank you! We’re all looking forward to next Shabbat! You’re welcome Michelle, congrats on your challah! Every time I make challah and braid, the dough does not form together. The finish product ends up being separate strands, but nicely baked. I don’t know what I am doing wrong, and I can’t find any literature on it. Any help would be appreciated. Hi Jenna, have you tried my recipe? 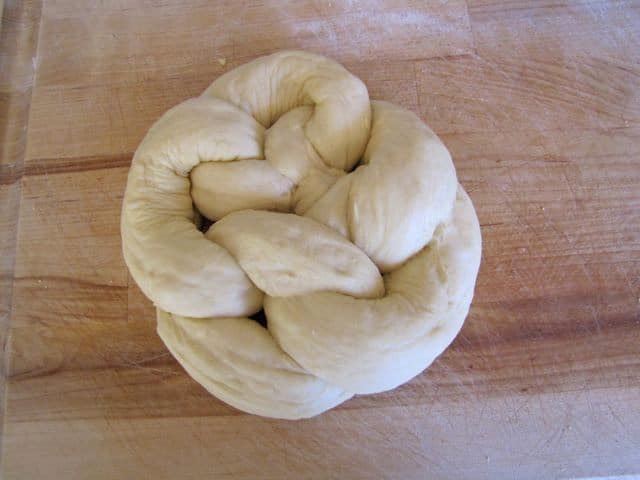 It might be the fault of the recipe and not the form of the strands… also are you making sure to let the dough rise one more time after it’s braided? Those are the two areas I would troubleshoot first. Your blog on Challah is helping me teach my classes and I wanted to say thank you. Also do you recommend any particular bread flour? Wow…..thanks so much for sharing. I’ve made it a few times with just the three strand and found it to be complicated and it didn’t look pretty but did taste wonderful just like you mentioned. I never could figure out the four strand one and now with your great detail I can try. Tori, your recipe is so good that I’m sure Kal used your basic Challah recipe to make different types of Challah !! I love the recipe and it will be the basic of many of my bread recipe, may be I will make them into Cinnamon Roll one day. In Penang the Bakeries seldom add in the melted butter or margarine before they sprinkle the cinnamon mixed with sugar or brown sugar but cook some syrup and pour over them that made them so soggy !! I tried to correct her but she insisted she got the real recipe. After 10 years that bakery closed down !! It was because this bakery started it and told people that she got the recipe from The Seventh day Adventist hospital, actually was not !! This recipe was given to the chef by Dr. “Ketting” a lady doctor from USA 40 years ago !! I knew the chef and saw him doing it, so I know the secret and now almost everyone who watch or collect recipe will know it too !! 40 years ago, no one knows the real recipe. Thanks to Internet and those willing to share their recipes !! Thank you so much for sharing!! On Wednesday, I made your rainbow Challah as a surprise for when my 4 year old got off of the school bus, he was enthralled!!! The kids loved it so much 🙂 Today I am just making it without the dye, love your clean instructions for 6 strand braiding. Instead of making two loaves today, I am making some rolls as well!! This is my new favorite recipe!!! Thanks Kal! I don’t think you got the rainbow challah recipe from me. The 6 strand braiding, probably yes, but the rainbow challah is not on my site. 🙂 Glad you enjoyed it though! Done! Thanks for subscribing Ava. Thank you so much for the shaping techniques. Very cool. Thanks for the tutorial! I just braided my first challah bread with the four strand method! I can’t wait to bake it now. Thanks so much for this awesome post! I just tried the 6 strand braid. It looks awesome and was so easy to do. Have a great day! very nice challos. Are you really a shiksa? I use high gluten flour. I just read your comment about the dough being too elastic and therefore causing it to stretch too much while cooking. I’ve been searching for a solution to this and am wondering if I try your technique of rolling out the strands before I braid them will help “relax” the gluten or should I let it sit even more? I use a bread machine btw. I was excited to try your recipe and the braiding technique. This was my first time to try Challah bread. Overall, it came it out pretty and yummy. I did come across the problem you mentioned about the white where the bread stretches, since it took baking it first to understand what you meant (I’m a visual person) I know next time. There is one problem I had. I made two batches of dough (thinking I did something wrong). The dough had too much elasticity, it was so hard to roll out and make strands. Any suggestions??? I want to try it again. Echoing other comments, but your directions for the 6-strand and the sequential photos were a tremendous help to me and my Challah “almost” looked like yours—one of my strands pulled a little too thin in a spot—but I think this will be my preferred braid going forward. I was making a large 3-strand loaf with a smaller 3-strand loaf on top of the larger loaf, but that usually worked best with a really, really warm kitchen. It’s December, and cold, and this 6-strand is beautiful! Thanks for the great directions. Shalom! 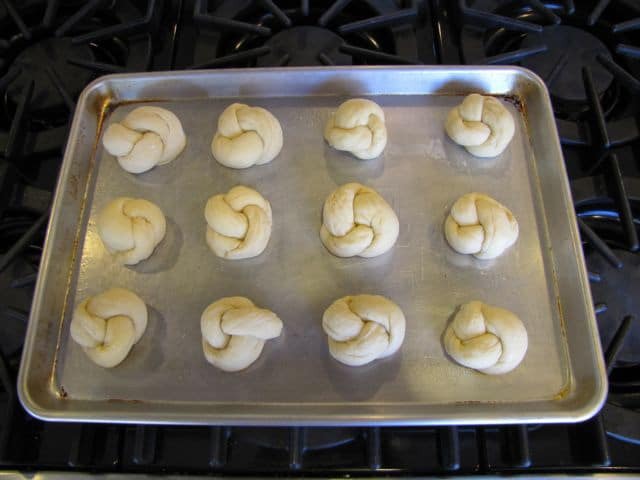 I love the Challah knots that you made, can I let them proved and then keep in the fridge then let them come to room Tem, then bake them ? I may make to Italian Garlic knot by mixing 4 cloves garlic, chopped , 2 T butter , olive oil , 1 t chopped fresh basil leaves , chopped fresh parsley, Salt and freshly ground black pepper , spoon 2-3 spoons of this mixture onto the knot before baking them. Or dip each strand into the mixture then tie the knot. I got that from other blog. I am so glad to find your blog, you’re marvelous in cooking. I know you don’t mind fans give you any suggestion as one blog, may be her husband or boy friend scolded the fan like hell if they suggested any idea or they changed it, just for example, baked it into other bread instead of Challah !! Asked them to leave that blog if they don’t follow her instruction !! My goodness !! I also left that blog too even though I did not write in before !! By the way, is Tori your name ? I love your blog and will try your other recipes. Love the braiding technique! The photos are very well thought out, showing JUST what I need to see. Thanks so much. I used the roll method tonight for Thanksgiving tomorrow. I split the lump of dough in halves, halves, halves etc, until I had 32, nice and even. The knots look great. The trays are chilling on the porch. (It’s 34F in New England tonight.) They need their final rise and an egg wash before the bird comes out and I can’t wait to see how they turn out. I’m sure I’ll end up with irresistable dinner rolls! To those looking for a dough recepie (someone asked), I use a Challah recepie from epicurious called “almost grandmothers Challah”. I love it. I use the same dough for my cinnamon rolls! 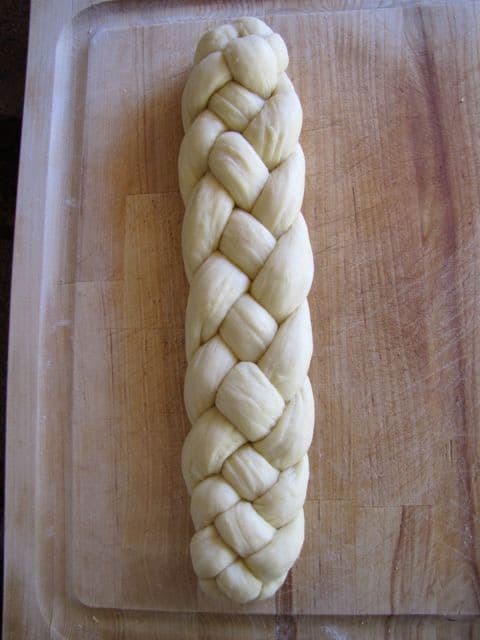 Anyway, I’ve saved the site and will be back when I make my next Challah to do a 4-strand braid! Thanks A Lot from Mike. You’re most welcome Mike, thank you for writing! Seriously gal, I have been baking challah for 20 years and I’ve never seen such innovative technique. You have just made it easy for me to try something new–it’s a happy day! 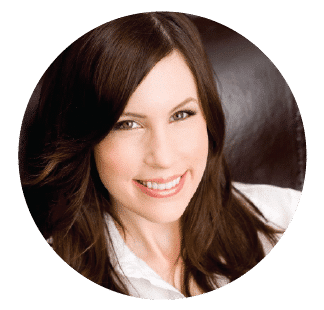 Your blog is so user friendly with the pictures and the very clear descriptions, it is a joy to use and I am telling EVERYONE. Again many thanks for sharing your passion! Thanks for these fantastic tips. I have never seen a linked challah recipe before. I teach a monthly challah class and will suggest this new design to my students. Also I use your idea for the “turbin challah” in what I call a “surprise challah” but I suggest doing the same hidden ingredients (raisins, chocolate chips etc.) in each strand. For a 6 braid I usually teach my students the mantra “2nd over all, 1st to the middle, alternate”. I’ll suggest your mantra “over 2, under 1, over 2” and see if this helps some of them master 6 braiding. This is the best tutorial I have found yet 🙂 Thank you!! “Over 2, under 1, over 2” <—makes it so easy! Dear The Shiksa, Thank you so much for you recipe and detailed instructions. I almost give up… I tried so much recipes, and non of them worked, till today, when I tried yours. You are the Best! 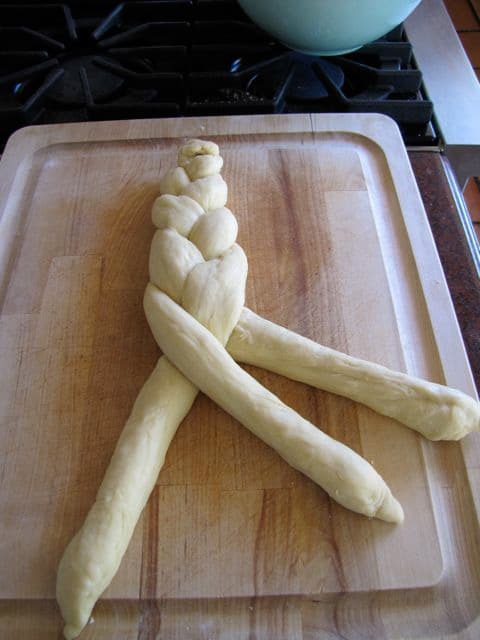 Let me understand this well, you let your dough rise TWICE before braiding. This would mean that after the first rise you make your strands, let them rise and then braid? 1. 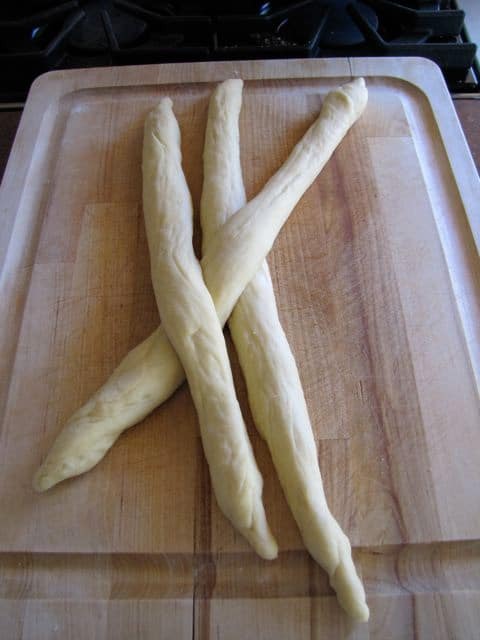 Make sure your dough has completely risen using a two-rise process before you start to braid. If you don’t, your strands may rise and expand while you are braiding, leading to a misshapen and sloppy-looking braid. The challah will still taste good, but it won’t look as pretty. 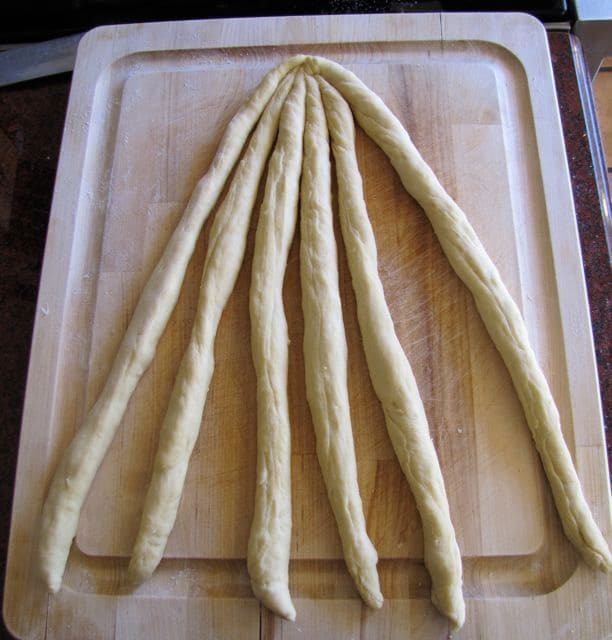 Hi Ibor– no, you want to let the dough rise twice (in unshaped dough form) before making the strands. After the first two rises, make the strands, then braid. 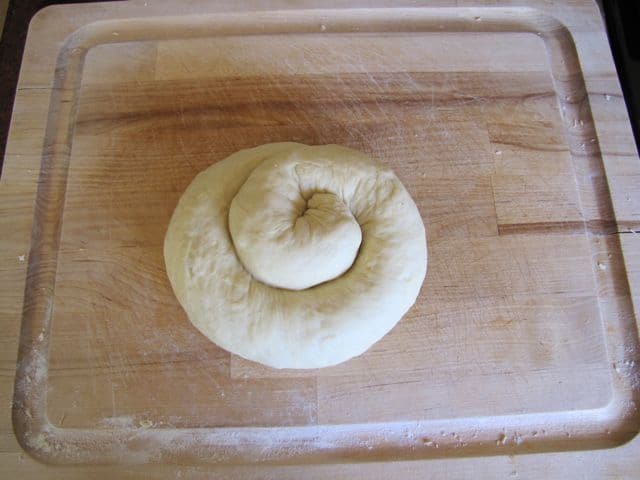 After the dough is braided, let it rise once more– that makes a total of three rises. Does that make sense? 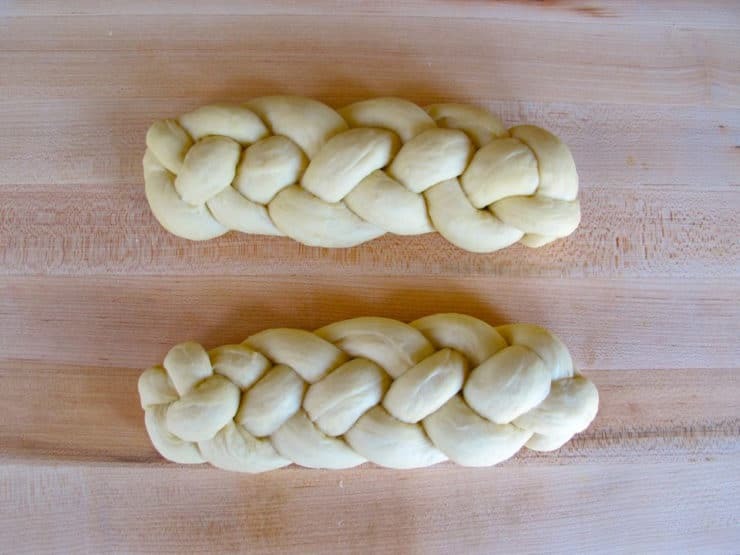 This is the only place I’ve found that gives such clear and easy instructions on braiding challah! The step-by-step pictures are amazing! Hi Tori, being left handed, I reversed your instructions, for the 4 and 6 strand braids, and viola. Your directions were so simple to follow. Thank you. By the way, would you happen to have a gluten free challah recipe? My son (who will be visiting with his family) is gluten intolerent. Thank you so much for the braiding tips. I really struggled with a 6 braid challah previously but your instructions make it look so easy. I am definitely going to try it that way. Joseph, my print plugin only supports printing without pictures at this time. If you want to print with pictures, you can copy and paste the text with pictures into a word processing document (like Microsoft Word). Hope that helps! Thanks for the perfect braiding instructions. I finally found a good bread machine recipe for the dough. I posted it on my blog with a link to your page for the “how to” on braiding. I actually just squealed, clapped my hands, and shouted, ” I could to that!” Embarrassing, but true….your photos showed every step clearly and for the first time, I GET IT!! Thank you!! I have always been a baker. But I must tell you the instructions you give to a novice baker for braiding are excellent! I always wonder why all these other websites/blogs give such complicated instructions. Yours is by far the best! 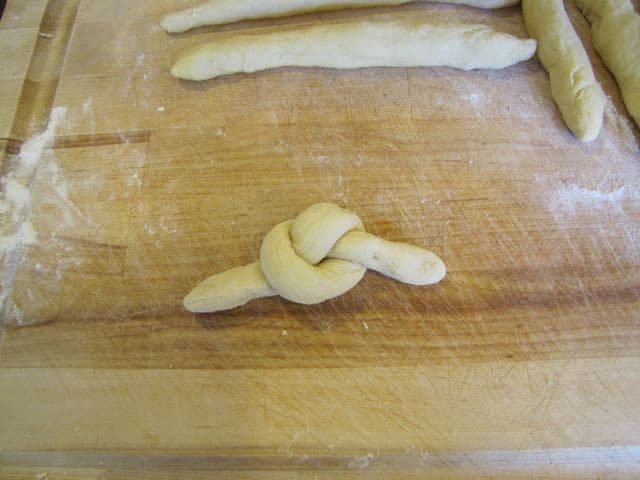 I have always favored the six strand, however, sometime its difficult to get the inners to bake. With four strand there is no problem. But, respectively, one baker to another I disagree with you changing your blog about putting the egg wash before the last rise. I always put the egg wash right before I put it into the oven because it gives a better shine to the finish loaf. And if I ever see any stretch marks while baking I quickly remove from the oven and brush more egg wash on the stretched marks cover.They come out beautiful.Just thought I’d share w/you all. Great site! Hi Stacy, so happy you’re having fun with the challah tutorial! For the 4 strand, I’ve never measured the strands, but I’m ballparking that they’re usually around 18-20 inches each. So long. But a shorter braid will work just as well– in fact, sometimes I make those “mini challahs” on purpose! Just keep an eye on it as it bakes to make sure you don’t bake it too long, it may not take as long to cook as a full size challah. Love the directions for the interesting braids! I have my own recipe but this will help with the Rosh Ha-Shannah breads and I’ve been trying to figure out challah knots, too. Can’t wait to try the 4 and 6 strand braids. Thanks for the great detail! A tip for Mike, who has difficulty getting even strands: Weigh your divided portions of dough on your kitchen scale before beginning to work with them, to make sure you have equal portions of dough. (Make sure to zero scale with container on it, then weigh portion of dough.) Adjust portion sizes as needed, then work with individual strands according to directions. I just wanted to tell you, your instructions for the 4- and 6-strand braids are the clearest I’ve seen. How do others make it look so much more complex? And thank you for the linked loop challah, I had always wondered how the loaf came out looking like that. Out of curiosity, if you were to put the raisins in the middle of each strand, as is done with the turban loaf, would that still work ok? 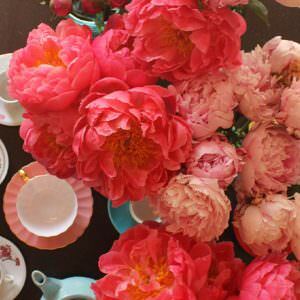 Thanks for the wonderful blog! Thank you SOOOO much Tori! I have been making challah with my gramdmother and mother since I was two and was never able to master to master the 4 or 6 braid. Thanks for your simple and easy directions. I now have 5 amazing challahs for Shabbat tonight! 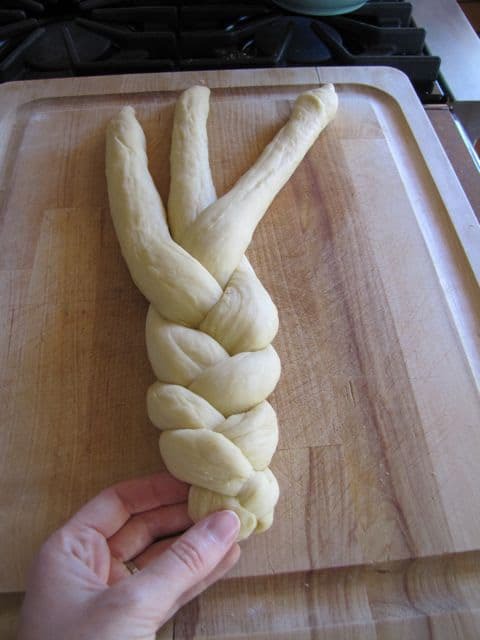 I just went to about five different websites looking for instructions on how to braid a 4 strand challah, and your instructions and diagrams are by far the best. Over, under, over. Now I get it. Thanks. You’re welcome Dena… and thanks, Annie! Let me know how it turns out for you. 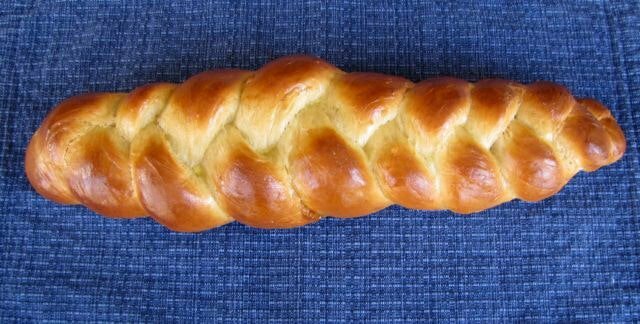 Always made challah using 6 strands and got frustrated while braiding when I realize I forgot a step somewhere near the end by being distracted by a phone call or a visitor. I will have to unbraid until I find the mistake. Will be using 4 strands from now on. Love your site. I will be trying your round ‘woven’ challah for high holiday next week. Love your method for incorporating raisins too. I have never made a challah bread, but I’m going to try it. Thank you for the braiding lessons. I usually do the 4-strand version. I’ll try a 6-strand after the holidays. i was wanting ur how to make the dough or do you use any kind or from scratch???? 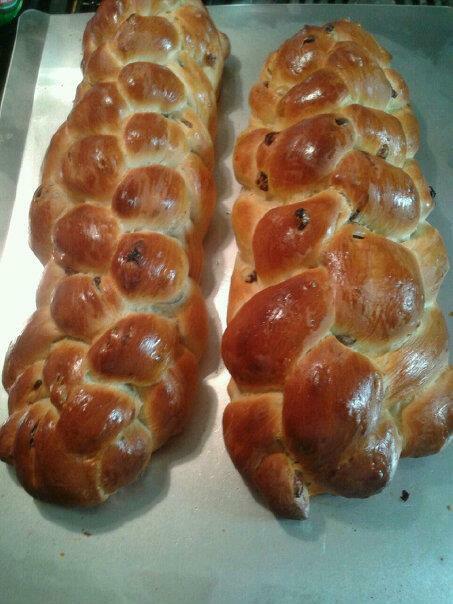 I was wondering: if you’re making the linked chains challah for Rosh Hashanah, how do you add the raisins? iEatDC please do send pics, I love the round woven challah– they’re beautiful! Thanks for the Rosh Hashanah lesson. This will be my first year making challah. I appreciate the attention to detail. It helps to have a reference. I know another way for a round challah! I’ll be making more before RH, so maybe I’ll photograph and post it/send it to you. It has to do with making a tic-tac-toe board with 4 strands and then weaving them around. Thank you so much for the tip on how to make the strands! I’ve been struggling since I started making challah to make even strands. I’ll definitely try this technique out next time I’m baking! I’ve always done a four-part braid, so thanks for the new ways to try! 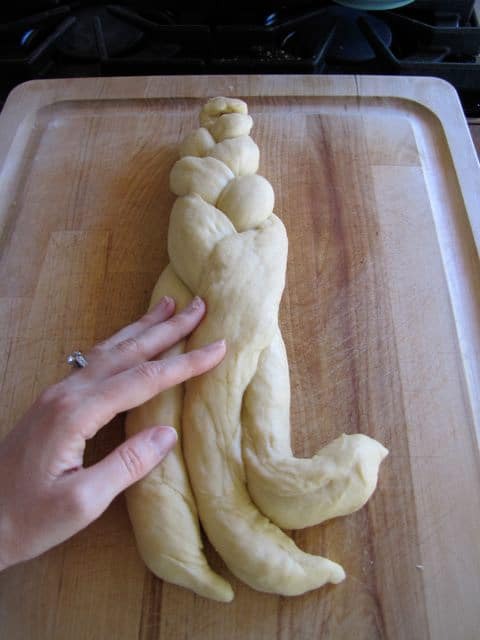 I can’t wait to try out your challah recipe this Shabbat. I usually make a six strand or a four strand, they are most elegant in my opinion. I’ve never tried the linked loops braid, will try that soon.